This post has been updated from an earlier version to include a statement from Naval Sea Systems Command. A Tuesday test of the Kongsberg Naval Strike Missile on Littoral Combat Ship (LCS) USS Coronado (LCS-4) was deemed a success and could pave the way to expand the anti-surface weapons portfolio of U.S. Navy’s surface ships. “We view this successful missile test as a possible future warfighting capability for the LCS program,” said Naval Surface Forces commander, Vice Adm. Thomas Rowden in a Tuesday statement. However, the successful test might not mean the NSM could find its way onto the LCS or the SSC and the Navy’s follow-on Small Surface Combatant (SSC) anytime soon, according to Naval Sea System Command (NAVSEA). “There is no linkage between the SSC taskforce and the NSM test. The findings of the Small Surface Combatant Task Force will be used to provide a Navy recommendation to the Secretary of Defense to procure a capable and lethal small surface combatant,” read a Wednesday NAVSEA statement to USNI News. The missile was fired from a launcher positioned on Coronado’s flight deck at a mobile ship target at the ranges off of Port Hueneme. The sea skimming and subsonic NSM has a range of about 100 nautical miles — greater than the Navy’s current Harpoon missile. The missile is also designed to evade radar. According to Rowden, the modular design of LCS would make it possible to integrate new weapons onto the platform. “This allows for the integration of weapons and sensors like the Kongsberg NSM technology as part of the LCS warfare suite,” he said. The test was facilitated through the foreign competitive testing (FCT) program following a demonstration of the NSM at the Rim of Pacific 2014 exercise. “Since 1980, the FCT program has helped the United States and allies reap substantial savings by avoiding research and development costs, lowering procurement costs, reducing risk for major acquisition programs and accelerating the fielding of equipment critical to the reading and safety of operating forces,” according to a release from Naval Surface Forces. No other missiles are being evaluated by as part of the tests, according to NAVSEA. Currently, the Surface Warfare (SuW) package of the LCS is oriented toward fighting an asymmetric swarm boat threat and full size naval threats. The lack of firepower onboard both variants of LCS has been a lingering criticism of the program for years and, in part, informed the decision of the Office of the Secretary of Defense (OSD) to instruct the Navy to take a second look at the LCS program. There is no linkage between the SSC taskforce and the NSM test. The findings of the Small Surface Combatant Task Force will be used to provide a Navy recommendation to the SECDEF to procure a capable and lethal small surface combatant. This is a separate and distinct action from the naval strike missile test which is part of the Navy’s process of continually exploring opportunities for improved capability and reliability across all programs. 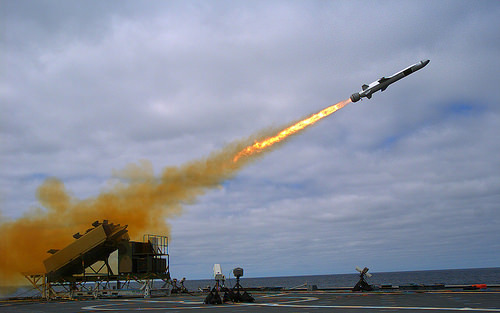 While there is currently no requirement for the naval strike missile, the Navy is interested in seeing the potential to execute an increased anti-surface warfare role on its ships. The test is a demonstration of the ship’s potential to execute an increased surface warfare role in both quantity of firepower and in range. Additionally, the test will provide insights into the weapon’s stated capabilities of increased range and lethality. No other missiles are being evaluated at this time.